Is this wiring safe and is it according to code? A single 12-3 cable was run to a double switch to control individual lights. The white is used as a hot, is this wiring correct/per NEC code? It appears that the original installer took the ground wire from the 12/3 cable, looped it around one switch ground screw, then attached it to the other switch ground screw. This grounds the switch yokes fine, but leaves the (metal) box ungrounded save through screw threads. The solution to this is to cut off the existing ground wire with some slack left, then nut it to pigtails to the switch ground screws and a ground screw (10-32) into the provided hole in the back of the box. While you're at it, you should wrap the white wire with black tape to make it crystal clear to the next bloke looking inside the box that it's hot and not neutral. Back before the 2011 NEC, an "old style" switch loop like this was permitted by the Code -- a single pole switch only needs always-hot and switched-hot, so a 12/2 cable could be used for a single switch or a 12/3 for a pair of switches sharing a hot feed, as you see here. The grounded conductor [neutral] shall be extended to any switch location as necessary and shall be connected to switching devices that require line-to-neutral voltage to operate the electronics of the switch in the standby mode and shall meet the requirements of 404.22. Exception: The connection requirement shall become effective on January 1, 2020. It shall not apply to replacement or retrofit switches installed in locations prior to local adoption of 404.2(C) and where the grounded conductor [neutral] cannot be extended without removing finish materials. The number of electronic lighting control switches on a branch circuit shall not exceed five, and the number connected to any feeder on the load side of a system or main bonding jumper shall not exceed 25. For the purpose of this exception, a neutral busbar, in compliance with 200.2(B) and to which a main or system bonding jumper is connected shall not be limited as to the number of electronic lighting control switches connected. Informational Note: The provision for a (future) grounded conductor [neutral] is to complete a circuit path for electronic lighting control devices. 404.22 Electronic Lighting Control Switches. Electronic lighting control switches shall be listed. Electronic lighting control switches shall not introduce current on the equipment grounding conductor [ground] during normal operation. The requirement to not introduce current on the equipment grounding conductor [ground] shall take effect on January 1, 2020. Exception: Electronic lighting control switches that introduce current on the equipment grounding conductor [ground] shall be permitted for applications covered by 404.2(C), Exception. Electronic lighting control switches that introduce current on the equipment grounding conductor [ground] shall be listed and marked for use in replacement or retrofit applications only. Not the answer you're looking for? Browse other questions tagged electrical wiring code-compliance nec or ask your own question. Coast 3-way — does this conform with Code? Are all of these wirings code-acceptable for 3-way switching overhead lights? old wiring inside wall gets voltage when shared switch is used - safe and to code? 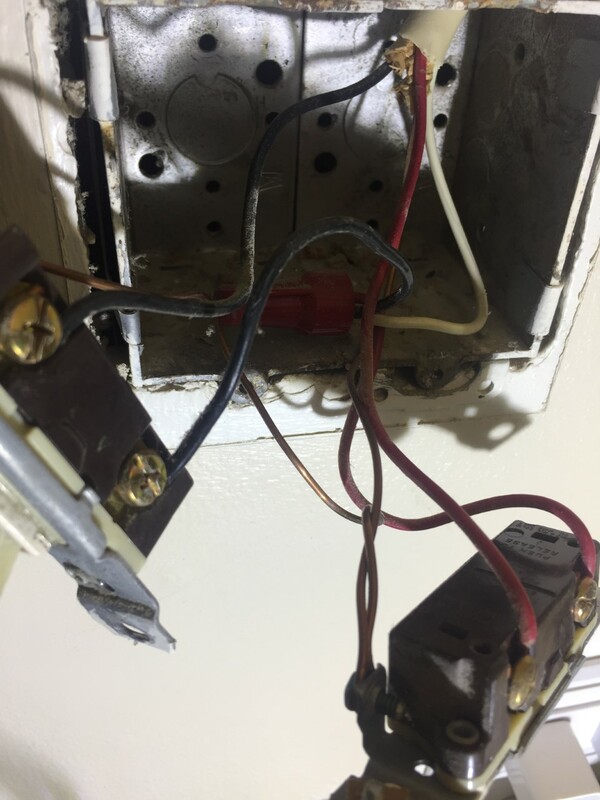 How can I remove one switch in a three-way circuit and maintain switch function?